Masterful folk music with fresh attitude. Nordic is one of Sweden’s best and most appreciated folk music bands. With an infectious charm and joy for playing, the band has made a name for themselves both in Sweden and abroad. The successes of recent years have led to several awards and have taken the band to stages in – amongst other places – Italy, Holland, Germany, Denmark, Finland, Poland, Latvia and Norway. With roots in folk music and with deep-seated knowledge the trio experiment freely in a quest for new expression. The result includes film-like compositions filled with soundscapes, rhythms, groove, reggae and improvisation. 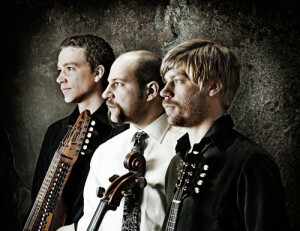 The unusual setting of cello, nyckelharpa and mandolin gives the group its own unique sound and contributes to Nordic’s experimental expression. At the Folk & World Music Gala 2010 Nordic received the prize “Ensemble Playing of the Year”.